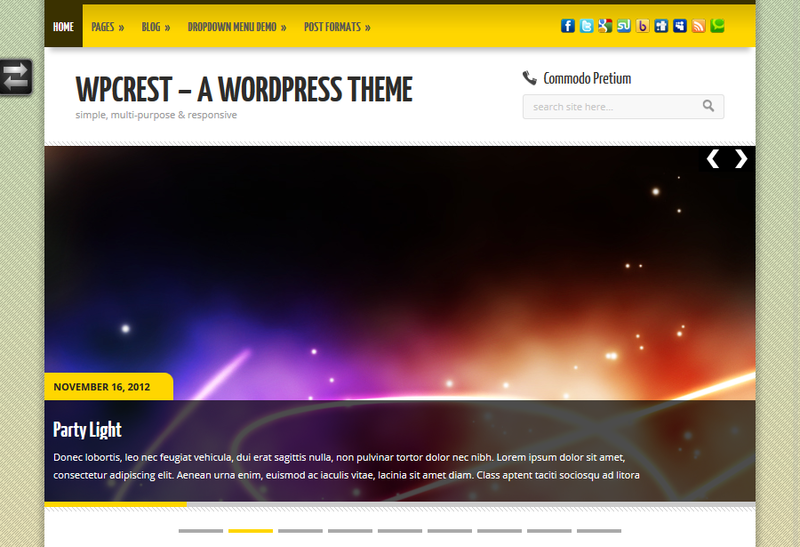 A premium version of the free WPCrest theme. 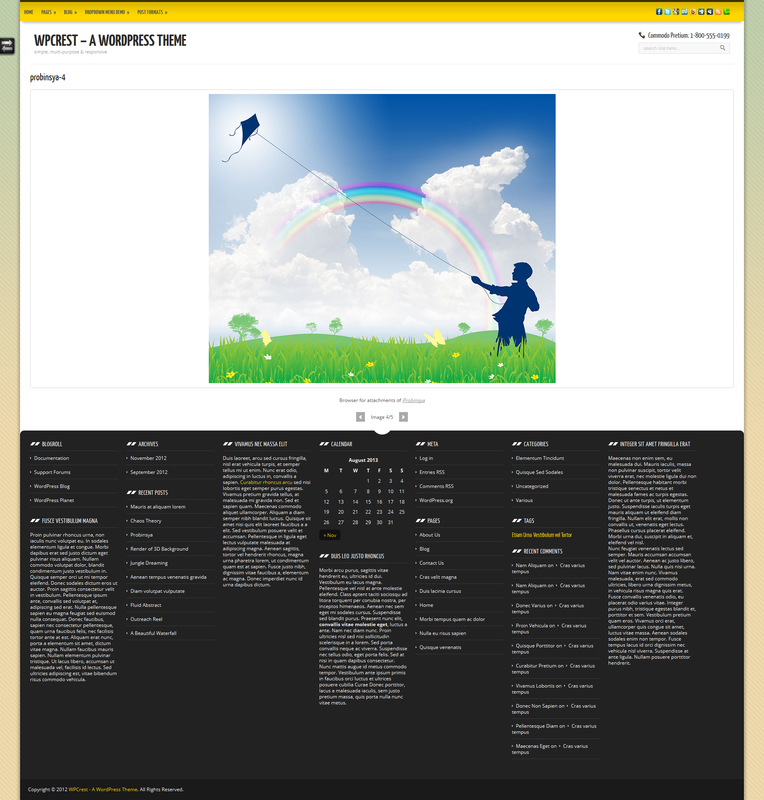 It is a child theme of WPCrest which provides various features not available in the free version which includes the ability of adding Slides, Services, Members and Testimonials to your posts and pages. 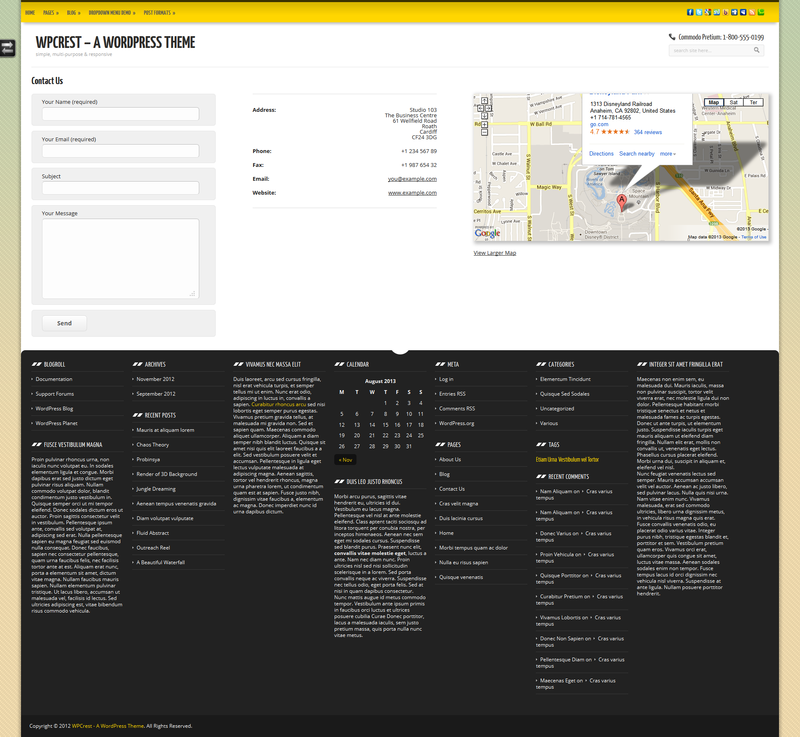 It also provides page templates for creating an About page and a Contact page. 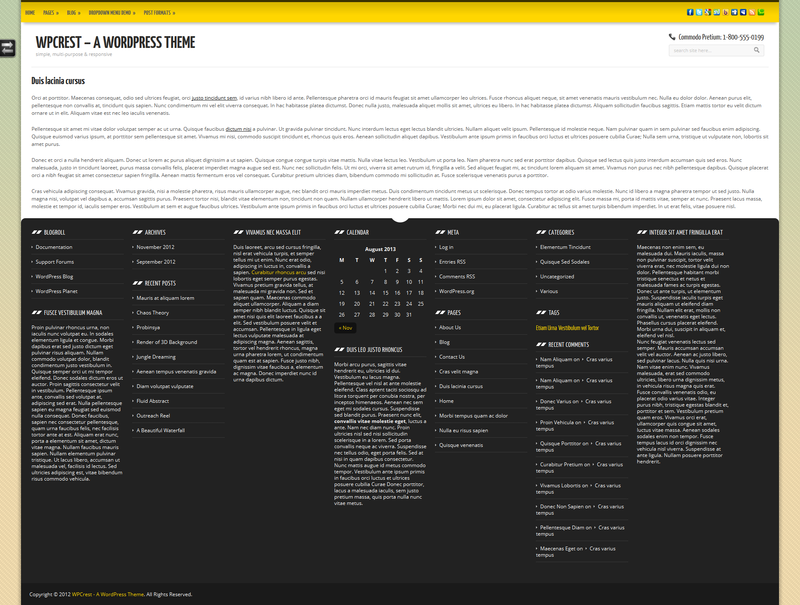 This is the official documentation accompanied with the WPCrest theme for WordPress. 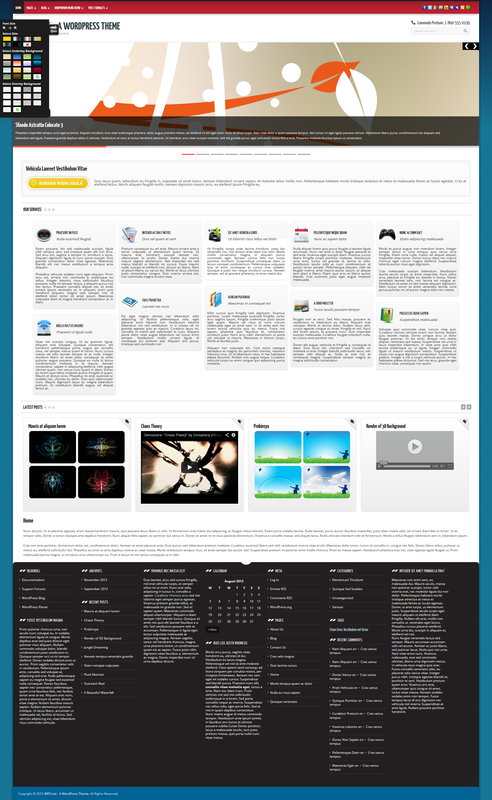 It covers everything you will need to set up and use the theme. This theme is a product of Rhyzz, a web development firm which has been developing websites and blogs using WordPress since 2006. It has been leveraging it's abilities to develop projects with complex requirements using WordPress by taking it to a completely different level. It is the author of the WordPress Fields Framework plugin. This experience combined with the weeks of effort that has been put into it's development makes WPCrest a unique and reliable WordPress theme. You can read more about this theme in the next section. 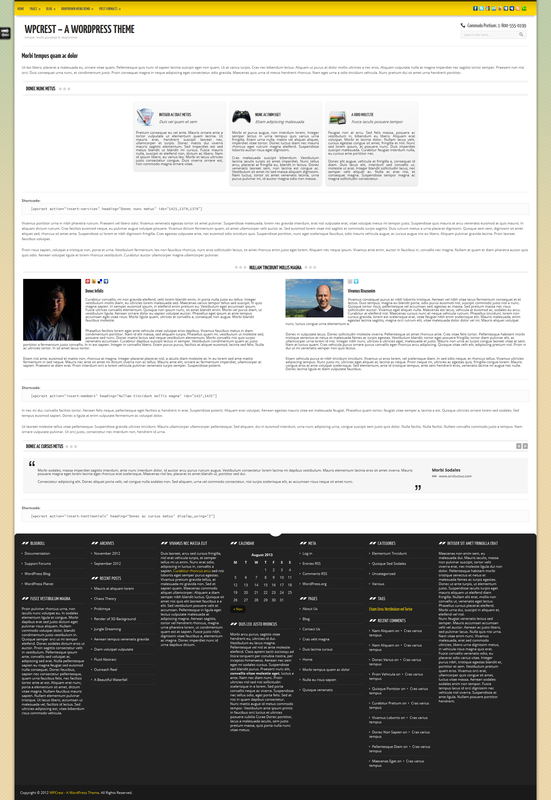 The official support page for this theme is maintained here. WPCrest is an elegant and easy to use WordPress theme which is responsive and uses a fluid layout. A responsive design is one which adapts the layout to the viewing environment to provide the best viewing experience to the user. WPCrest takes into consideration a wide range of devices which includes desktop computers, laptops, mobile phones and tablets. If the resolution depth being used by the user to view the website is small then the theme will shrink the layout accordingly to ensure easy reading and navigation. Regardless of whether a user is using a device which has a resolution that's 320 pixels wide or 1920 pixels wide, the theme won't compromise the user's experience browsing through your website. To get a better idea of it's responsive nature, it is suggested you view the demo of the theme using a mobile simulator such as Opera Mini simulator. Alternatively you can look at the screenshots numbered 24.jpg to 35.jpg. These images show how the theme adjusts depending on viewport's width. 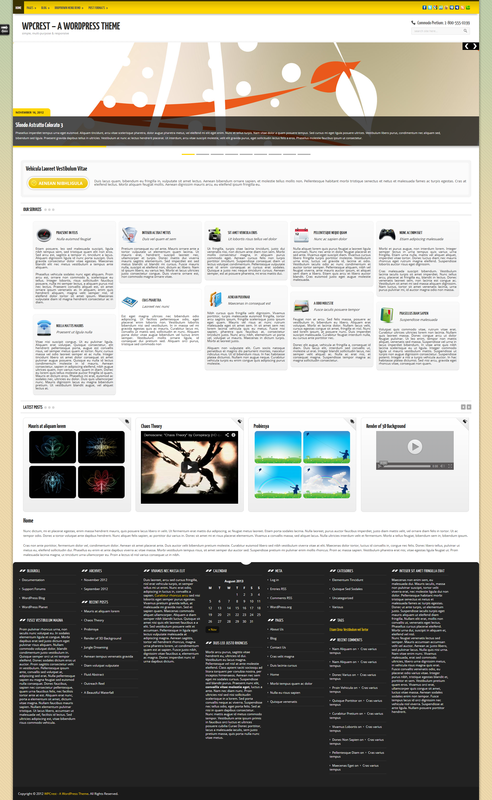 The theme comes packed with a number of features which are outlined below. They are grouped under 'For Users' and 'For Designers and Developers'. As a user you won't have to worry about the 'For Designer and Developer' features to be able to use this theme. A Teaser which lets you display a title, a small description and a call to action button. Services section which lets you create and display a list of services offered. You can also associate every service with an icon. Members secthin which lets you create and display members of your team/business. You can also upload an image of the member. Ability to replace text logo/description with a logo. Also lets you upload your logo right from the backend. 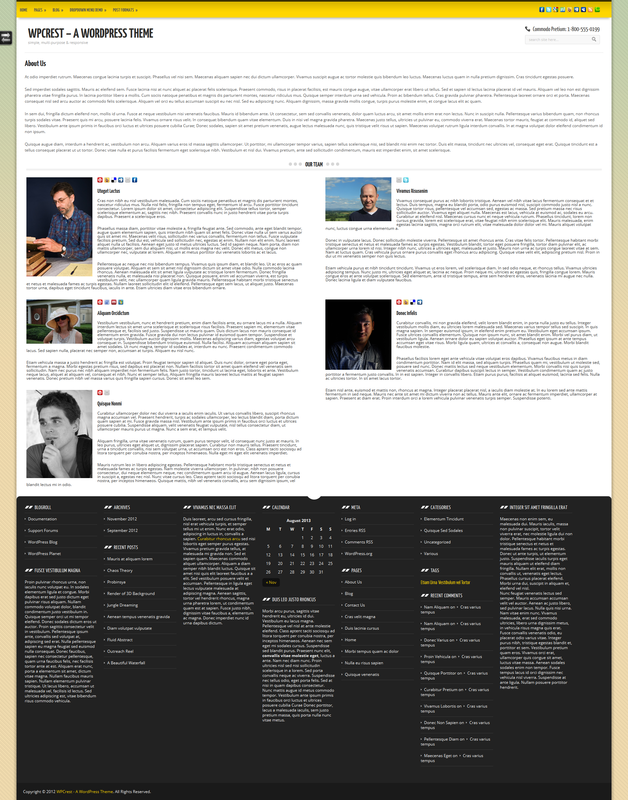 Here are links to a demo installation which let you see all sections of the theme. This section covers the installation of this theme. 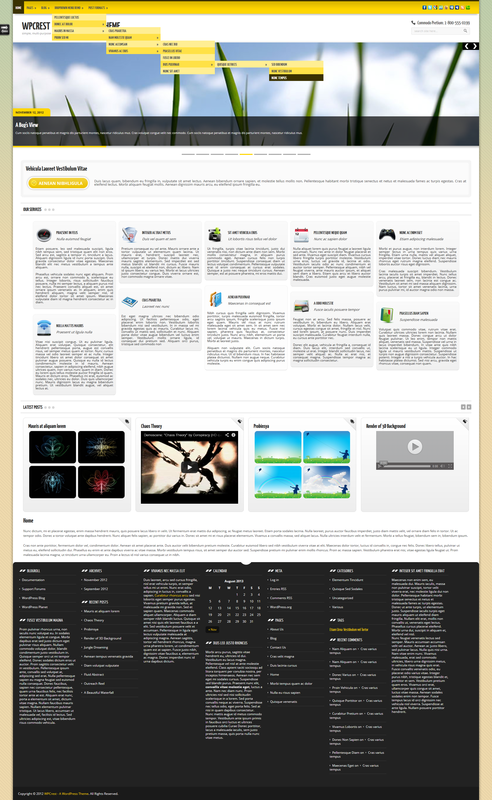 You must have download and install the free parent version of this theme from here. Do not activate this version though! This one is the quickest way to install the theme! 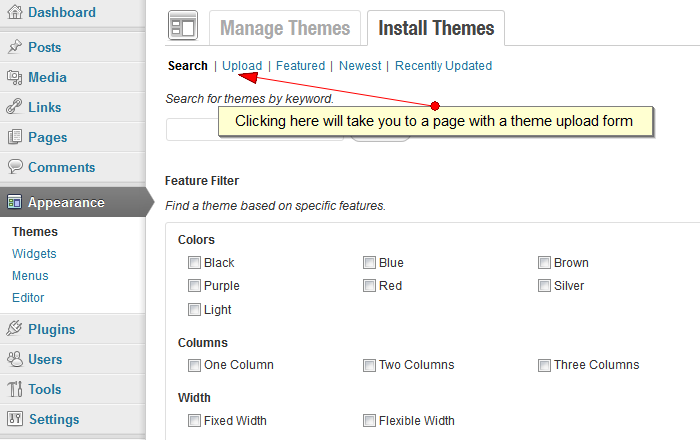 All you have to do is navigate to Appearance -> Themes -> Install Themes from your WordPress administration area. Once there, click on the 'Upload' link on the top. Now that you have the theme upload form on your screen, click on the 'Browse' button and navigate to the folder which contains the file named 'wpcrest-extended.zip' and select it. Click on the 'Install Now' button and wait! 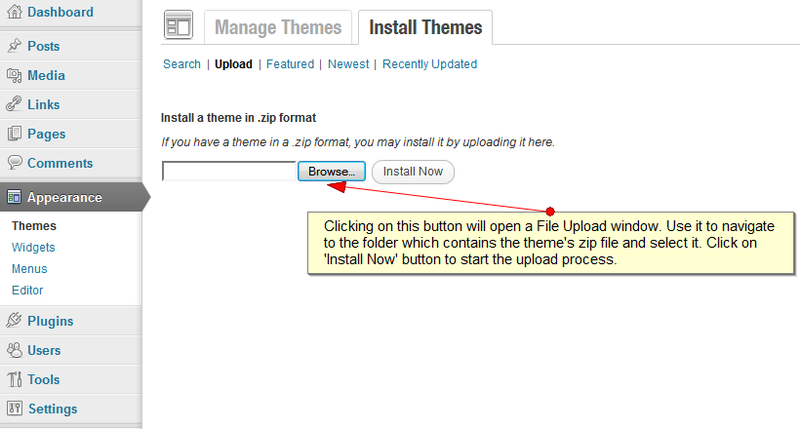 Your theme should be installed in a jiffy! Your theme should now be installed! Congratulations! You can now head towards the Initial Setup sub section. WPCrest requires that you have the following plugin installed and activated to manage options from the backend. 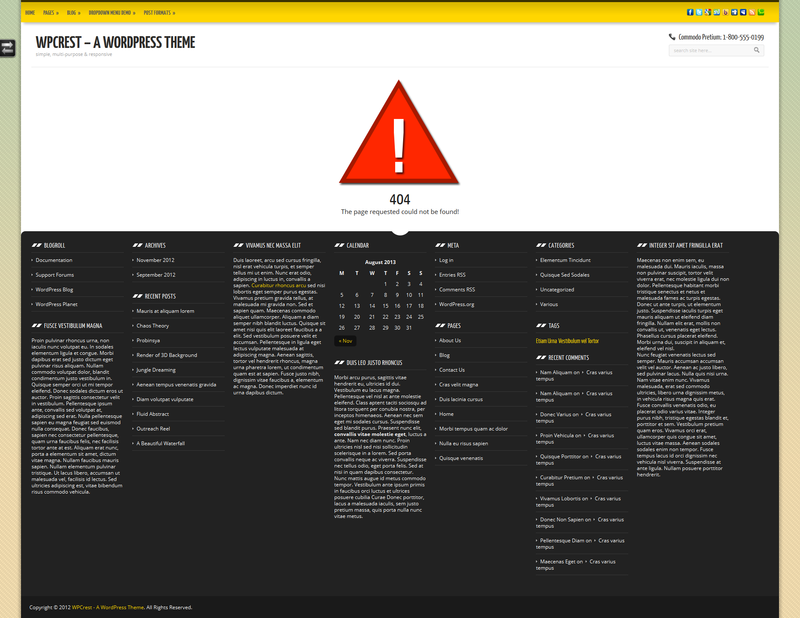 WPCrest has in-built support for the plugin below. So all you have to do is just install and activate these plugins and you are done. Now that you have installed the theme successfully, you should be seeing a new menu on the bottom of the sidebar of your administration panel labeled 'WPCrest'. This menu is divided into various sub menus. 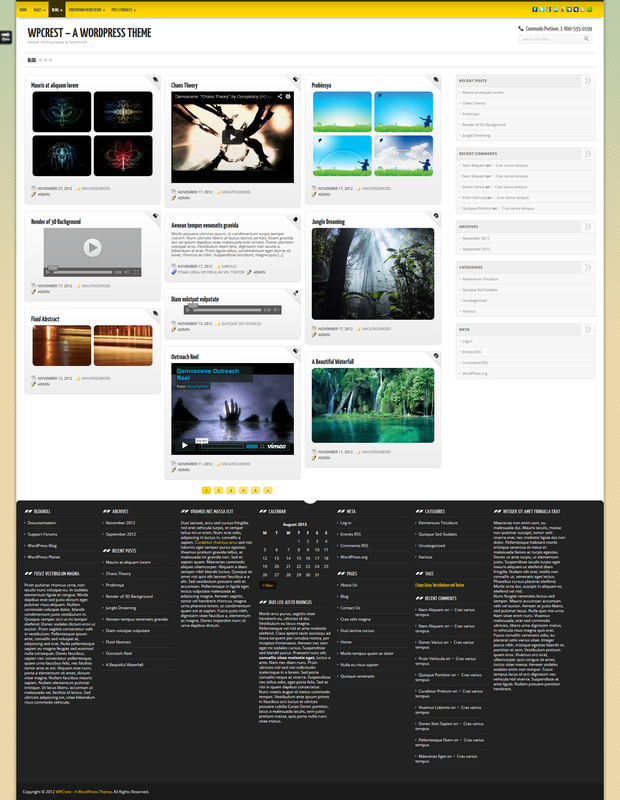 The basic configuration of the theme is done using the Configuration sub menu. Enable this option if you want to use an image based logo rather than text for the title and description. Enter URL of your logo image here or upload one. This image will only be used if the above option is enabled. Enter URL you want the title/logo to link to. Leave this blank if you don't want them to be a link. Enable this if you want to display a support section in the header which can display a text message of your choice. Specify icon to display if you don't want to use the default telephone icon. The theme also includes an email icon. Enter your Call to Action text which you want displayed next to the icon. While the content of a page is downloaded and loaded, a preloader is displayed. You can disable this behaviour using this option to prevent the display of a preloader. Similar to the above except that this one is displayed during AJAX requests. By default AJAX is used for navigating through paged sections of archives. This means the page won't have to reload when a user clicks on a link inside the pager. You can select the default scheme you want to use from here. 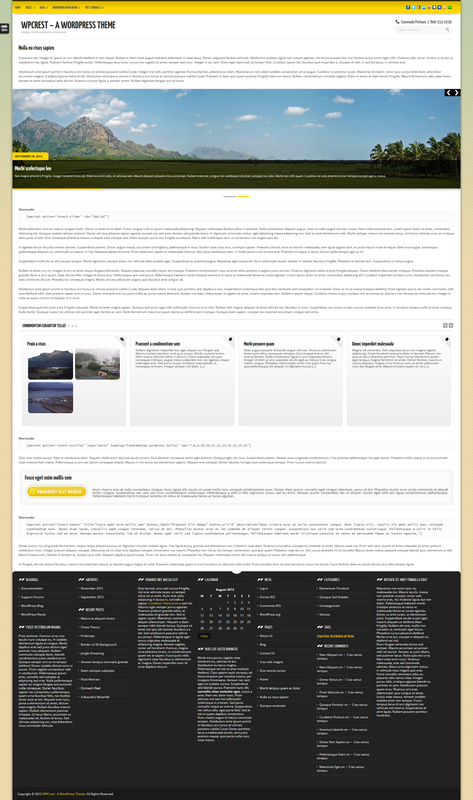 If you select None here, the grayscale version of the theme will be displayed. Remember, if you disable the scheme switcher then the scheme you select here is the one which will be visible to your visitors. If you do not want to let visitors be able to switch the site's scheme that is visible to them then you can choose to disable the scheme switcher using this option. Default value for this is no. By default all external links are configured to open in a new window. You can disable this feature to prevent that from happening. Enable this if you want URLs pointing to media like images or PDF documents to open in a new window. By default comments are enabled for posts. You can disable this using this option. By defaults, comments are disabled for pages. You can enable them using this option. The social media icons section on the top right area is controlled using this section. Enter your links for the services you would like to use. The title field is used as the alternative image for respective social media icons. By default your slides, teaser and featured content are inserted automaticlly on the homepage. If you want more control over your homepage then you can disable automatic insertion and add these manually from the content editor by using their relevant shortcodes. This option lets you move the content on your homepage to the bottom. Using this option you can decide how the slides are fetched. You can choose to select the slides you want to feature manually or you can automate this by specifying whether to fetch them by latest added or page ordering you have set. Using this option you can decide how the posts are fetched. You can choose to select the posts you want to feature manually or you can automate this by specifying whether to fetch them by latest added or page ordering you have set. This provides usage instructions for various sections. 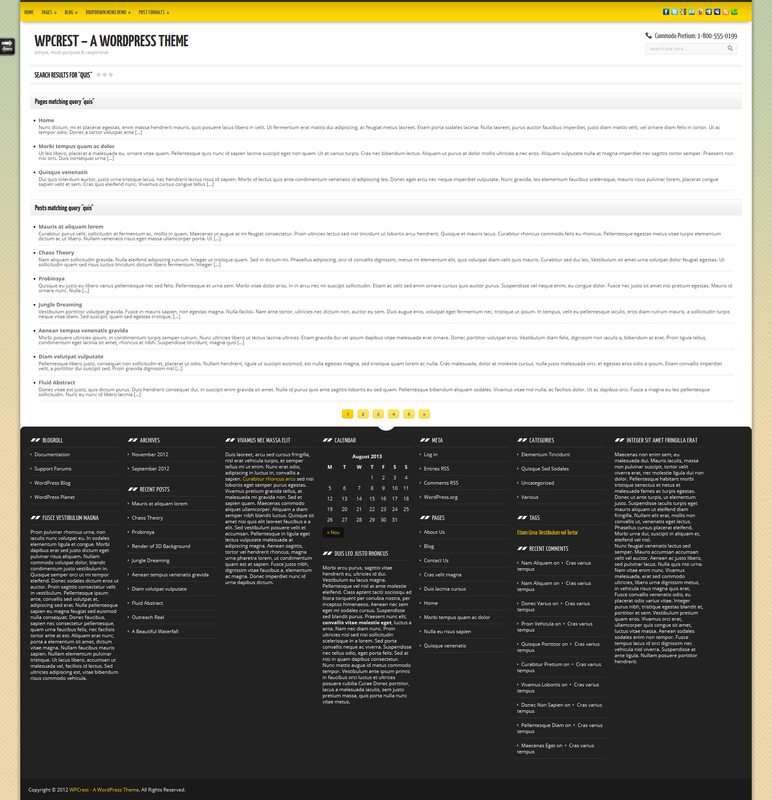 WPCrest has support for 4 custom post formats viz. Image, Gallery, Video and Audio. You can create your posts using either one of these Formats or you can create it using the standard format. To select a Post Format, while creating your post just look for the heading 'Post Format' which will probably be right under the editor. 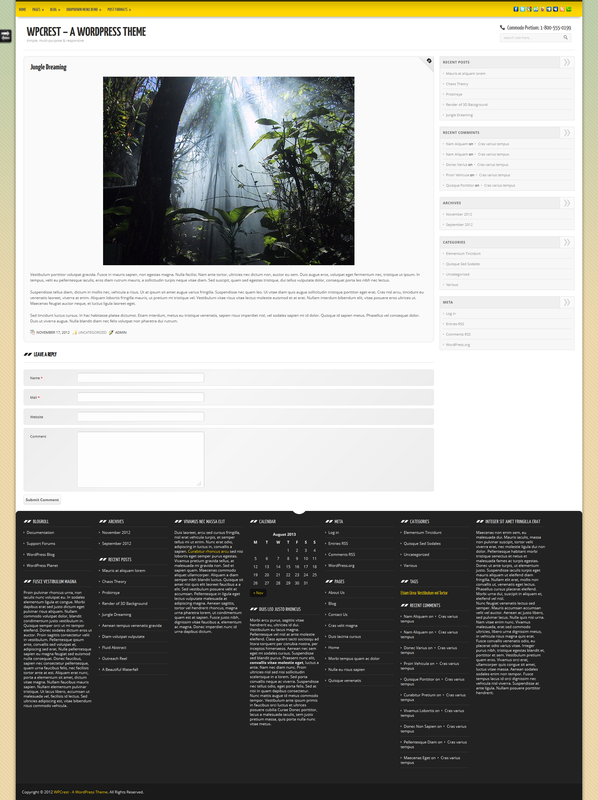 From here you can select which format you want to use for a post. The Image Format is suitable for posts which feature a single image. You can upload the image you would like to feature either using the form provided under Post Formats Image section or using WordPress' Upload/Insert media section. The former gives you more flexibility as you can provide a direct URL to the full size and small size image. The small size version isn't required however the full size version is required. If you don't want to use this section you can just upload the image using the Upload/Insert media section. You don't need to do anything after uploading it from there as the image will be fetched automatically on the frontend. The Gallery Format is very similar to the Image Format, the diffence being that this time lets you upload more than one image, hence the name gallery. So if you have a post which will feature more than one image then you can use this format. Usage for this is the same as the Image Format section. If you use the Upload/Insert media section for managing gallery images, you can upload as many images as you would like and you can control ordering using the order feature provided by this section. The Video Format is for displaying featured videos. You can either upload the video locally or you can insert a link to an external video. You can link to a direct video file or to a video hosted using a service like YouTube or Vimeo. The Audio Format is for displayed feature audio clips. This defines a teaser with a title, button label and link and it's description. As easy WPCrest is to use, it's equally easy to modify it if you have some coding skills. There are two ways you can customize the theme. One involves the use of creating a Child theme where as the other lets you do it without creating a Child theme. Please don't modify any of the theme files directory because your modifications will be lost when you update the theme to a latter version. Instead use one of the methods outlined here. This method is well suited if you don't require any major customization. If you do then creating a Child Theme might be a better option. If you want to load your own PHP code, all you have to do is create a file named functions.php and save it under WPCrest/custom/php/. This directory don't exist by default so you will have to create it first.